THE FULL moon day in the month of Ashad (July-August) is an extremely auspicious and holy day of Guru Purnima. 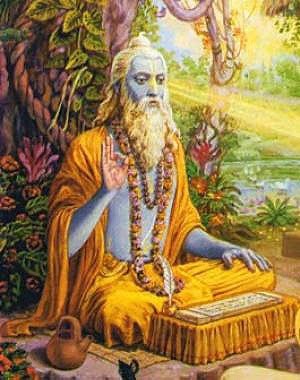 On this day, sacred to the memory of the great sage, Bhagavan Sri Vyasa, Sannyasins settle at some place to study and discourse on the thrice-blessed Brahma Sutras composed by Maharishi Vyasa, and engage themselves in Vedantic, philosophical investigation.Sri Vyasa has done unforgettable service to humanity for all times by editing the four Vedas,writing the eighteen Puranas, the Mahabharata and the Srimad Bhagavata. We can only repay the deep debt of gratitude we owe him, by constant study of his works and practice of his teachings imparted for the regeneration of humanity in this iron age. In honour of this divine personage, all spiritual aspirants and devotees perform Vyasa Puja on this day, and disciples worship their spiritual preceptor. Saints, monks and men of God are honoured and entertained with acts of charity by all the householders with deep faith and sincerity. The period Chaturmas (the “four months”) begins from this day; Sannyasins stay at one place during the ensuing four rainy months,engaging in the study of the Brahma Sutras and the practice of meditation. The Srutis say: “To that high-souled aspirant, whose devotion to the Lord is great and whose devotion to his Guru is as great as that to the Lord,the secrets explained herein become illuminated”. Guru is Brahman, the Absolute, or God Himself. He guides and inspires you from the innermost core of your being. He is everywhere. Have a new angle of vision. Behold the entire universe as the form of the Guru. See the guiding hand, the awakening voice, the illuminating touch of the Guru in every object in this creation. The whole world will now stand transformed before your changed vision. The world as Guru will reveal all the precious secrets of life to you, and bestow wisdom upon you. The supreme Guru, as manifested in visible nature, will teach you the most valuable lessons of life. Worship daily this Guru of Gurus, the Guru who taught even the Avadhuta Dattatreya. Dattatreya, regarded as God and the Guru of Gurus, considered Nature Herself as His Guru, and learnt a number of lessons from Her twenty-four creatures, and hence he is said to have had twenty-four Gurus. Remember and adore Sri Vyasa and the Gurus who are fully established in knowledge of the Self. May their blessings be upon you! May you cut asunder the knot of ignorance and shine as blessed sages shedding peace, joy and light everywhere ! After bath, worship the lotus feet of your Guru, or his image or picture with flowers, fruits, incense and camphor. Fast or take only milk and fruits the whole day. In the afternoon, sit with other devotees of your Guru and discuss with them the glories and teachings of your Guru. Alternatively, you may observe the vow of silence and study the books or writings of your Guru, or mentally reflect upon his teachings. Take fresh resolves on this holy day, to tread the spiritual path in accordance with the precepts of your Guru. At night, assemble again with other devotees, and sing the Names of the Lord and the glories of your Guru. The best form of worship of the Guru is to follow his teachings, to shine as the very embodiment of his teachings, and to propagate his gloryand his message.